NBC's Megyn Kelly has struggled with ratings since she joined "Today" in September, but her show has recently seen a slight turnaround after shifting coverage to focus on the slew of sexual misconduct scandals. Kelly’s "Today" hour debuted Sept. 25 to lower than expected ratings, and have remained low. However, ratings began to climb in recent weeks when Kelly stopped her attempt to purely conduct lighthearted discussions and began an ongoing discussion about sexual harassment, the Washington Post reported. The former Fox News anchor has since conducted interviews with accusers of movie mogul Harvey Weinstein, Fox News host Bill O’Reilly, and MSNBC political analyst Mark Halperin. During the show’s premiere, Kelly made a promise to viewers that she would avoid politics and invited audience members "to have a laugh with us, a smile, sometimes a tear, and maybe a little hope to start your day. Some fun! That's what we want to be doing. Some fun." Despite Kelly’s pledge to avoid politics in her new position at NBC, her discussions now include an interview with three women who have accused President Donald Trump of sexually inappropriate behavior. On Monday's show, Kelly interviewed Jessica Leeds, Samantha Holvey, and Rachel Crooks, three of the 12 women who have accused Trump of sexual harassment, as noted by the Post. After the show, the women participated in a news conference hosted by Brave New Films, who released a documentary on Trump’s accusers in November. The women again told their stories and called for Congress to conduct an investigation into the allegations of sexual misconduct against the president. The interviews with sexual harassment accusers have become an important cornerstone of Kelly’s morning talk show, creating a beacon of hope for the show that has struggled with ratings since its September debut. 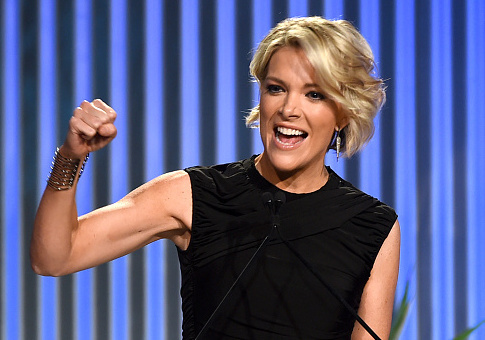 Kelly’s reviews were widely negative and ratings were abysmal while she stuck to her "no politics" format for the first few weeks, peaking at 24 percent less in viewership compared to the prior year in week two. The tides began to turn on Oct. 23 after she delivered a monologue critical of Fox News for its handling of sexual abuse allegations, specifically against her former colleague O’Reilly, who was forced out in April. "O’Reilly’s suggestions that no one ever complained about his behavior is false. I know because I complained," Kelly said on her show. "Women everywhere are used to being dismissed, ignored, or attacked when raising complaints about men in authority positions. They stay silent so often out of fear … of public shaming, including through the media." Her pointed monologue was widely praised in the media, including during an interview on "Late Night" with Seth Meyers, who thanked her for her speech, calling it "impassioned" and "wonderful." During subsequent episodes of her show, Kelly continued to address sexual harassment, discussing powerful men who had been accused of sexual misconduct, including Trump, former president George H.W. Bush, Halperin, and Weinstein. Ratings immediately jumped by 10 percent during the week Kelly interviewed Halperin and Weinstein accusers, making it the shows best-rated week. Kelly’s hour of "Today" has maintained the boost and has drawn an average of 2.296 million viewers through most of November, still "historically low" compared to past Novembers, according to the Wrap. Despite the shift in content, the show’s executive producer, Jackie Levin, said it was keeping with the show’s original goals. "Our goal from the beginning was to present a smart, informative program that would uplift, inspire, and empower," she told Variety in a statement. "Sexual harassment in not only dominating headlines, but is pervasive, affecting nearly half of women in the workplace, according to recent pills. Given it’s a topic that Megyn also feels very strongly about, it’s been a natural fit for her to cover in a way that has hopefully helped empower viewers." Kelly hasn’t completely eliminated her lighter sequences, but weaves them in between critiques, commentaries, and interviews regarding sexual assault, the Post noted. This entry was posted in Culture and tagged Donald Trump, Megyn Kelly, NBC, Sexual Harassment. Bookmark the permalink.